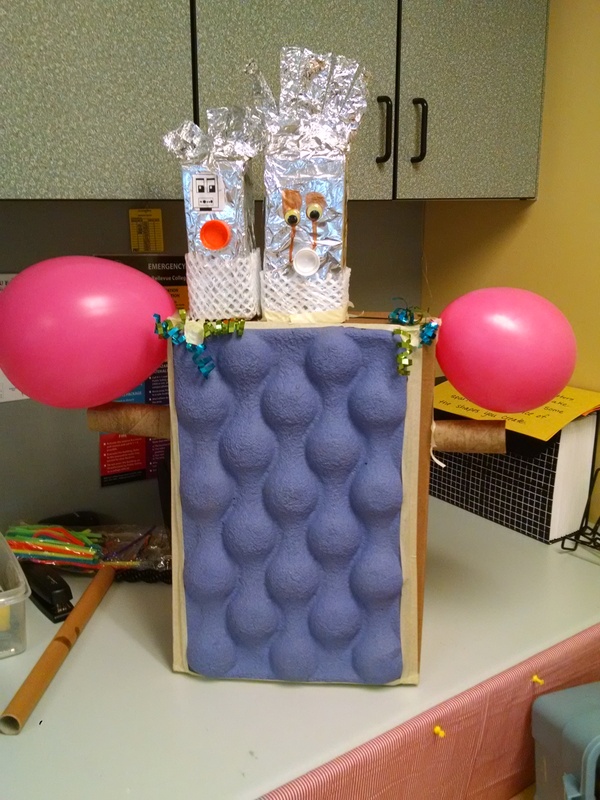 In our Inventors Lab, we use a lot of materials from the recycling bin in our projects – cardboard boxes, water bottles, plastic lids, jelly jars, and so on. When we need to buy, we generally try to use common everyday items, instead of specialty supplies, such as using Dixie cups rather than searching online and special ordering some precious little mini wicker baskets. Why do we choose this? Cost: yes, as a non-profit, we look at keeping our class expenses as low as possible so we can keep the class tuition as low as possible. So, cheap is good. Environment: Re-using rather than buying new is better for the environment. Purchasing items at the neighborhood store means less fuel than having small items delivered to your house in a package. So parents don’t feel guilty throwing it away / breaking it up and recycling: We know that parents of modern children are continually bringing home goodie bags from parties, happy meal toys, and numerous craft projects. It quickly becomes over-whelming. We want the parents in our class to know that what’s important is the child’s PROCESS of creating something, then bringing it home and sharing it with their family. The product isn’t that important – it’s not beautiful because it doesn’t have to be beautiful for them to have learned from doing it. You don’t have to keep it forever, because the memory of learning is more important than the product. Approachable: The most important reason we choose simple materials is that we want both parents and children to feel like this is an approachable project. Building things and creating science projects is something that ANYONE can do, ANY TIME, ANYWHERE. You just run around the house, gather materials and start to build. Child Led: If we had a lot of expensive, fragile equipment and materials, we would tend to hover over the kids, reminding them over and over to be careful. If everything is kid friendly then we can sit back and let them lead the work. Encourages creativity: I saw a post recently on Facebook about someone asking how to manage her child’s requests – she loved that he liked creating and building things all the time, but didn’t like that he was always asking for new props – last week he built a western scene so needed plastic horses, this week he’s asking for plastic whales for an ocean theme. She was frustrated at having to make so many runs for supplies. My thought was – ask him to make the props he wants!! You could have model magic clay or sculpey laying around if you want to, but he could also cut things out from paper or cardboard or find photos in a magazine or many other options. My mother-in-law is the queen of creating from scratch. She grew up poor in Argentina long ago, before you could just run out to the dollar store or Michael’s and spend a couple bucks on a tube of plastic animals imported from China. 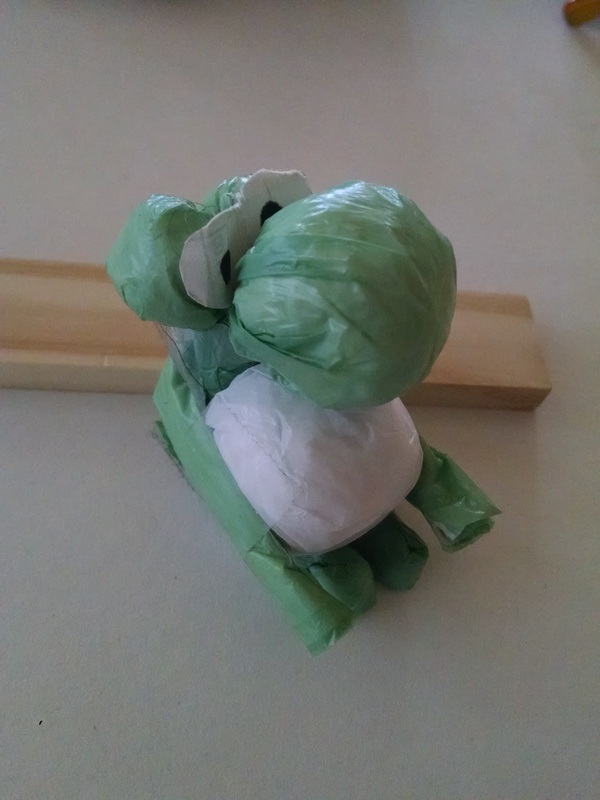 So, she builds a vast array of toys for my kids out of cardboard, tape, and other available supplies… My favorite was when my son wanted a Yoshi (from Mario Brothers) and she made one out of grocery bags and tape! Check it out…. From Robot week. The foil and balloons were new, but all else came from the recycling. Jet pack from Space Travel week. The crepe paper and tape are new. The juice bottle is recycled, as is the plastic lid that decorates it. The stuffing and bias tape are from a collection of old sewing supplies that a teacher’s relative had owned for many years. 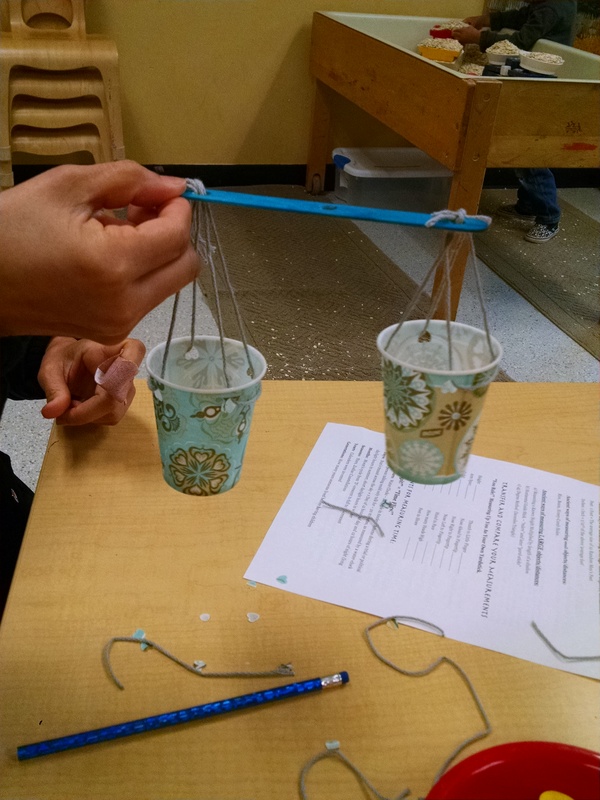 Levers week, a balance made of popsicle sticks, Dixie cups, and yarn from a thrift store, that will then balance on a pencil. 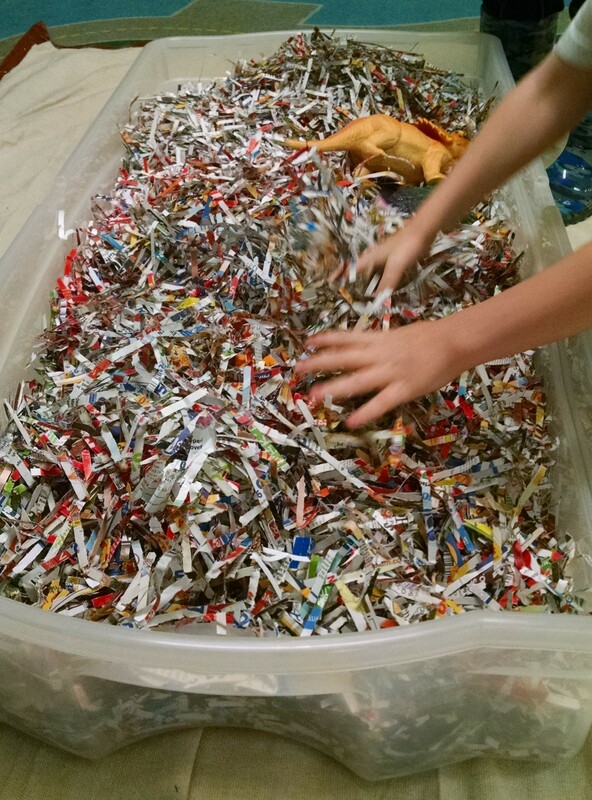 A dinosaur dig, with dinosaurs buried in materials from the office shredder. What do you do to try to keep your costs down, environmental impact low, and creative use of available materials high?